While the fourth entry is still my favourite in the Civilization series, I’ve still logged a good 200 hours on the Steam version of Civilization 6. 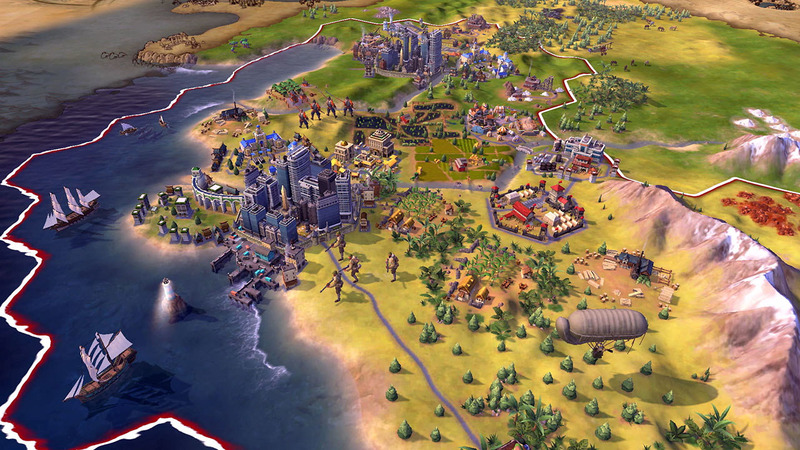 Despite that I was dubious when Civ 6 was announced for Switch – the series has a middling history of console ports that doesn’t exactly inspire confidence. The best attempt up until now was 2008’s Civilization Revolution, a great attempt to make the Civ formula work on console and a great game in its own right, though it was a significantly streamlined and simplified experience that many PC-playing Civ veterans were left cold by. It was a good facsimile of Civ, but not really the real deal. Civilization 6 on Switch is the real deal. It’s the PC game shrunk down with little in the way of corner-cutting or compromises to get the experience to feel right on a console control scheme. This is for better and worse in some instances, it has to be said, but the fact that this is a ‘full fat’ Civ experience can’t be understated. That is what makes this game, in fact – this is the same experience of building up a sprawling world-spanning Civilization over time, conquering the planet through military conquest or peaceful means like cultural, religious or scientific superiority. Civ 6 was brilliant on PC, and it’s here in all its brilliance in a smaller form factor. On that topic, it should be noted that this is the original Civ 6 and not the Civ 6 on Steam today. This doesn’t include the Rise and Fall expansion pack and also lacks online play – though playing Civ online is a cumbersome, slow experience even on PC, so isn’t in my opinion an enormous loss. Several quality-of-life improvements from later PC patches are present, however, and there’s still plenty of content in that base version of the game. Civ 6 makes its way to Switch via tablet, with this version coming from port house Aspyr – the same studio that managed to craft a surprisingly PC-accurate experience on iPad late last year. Aspyr is no stranger to Civ, having worked to help to support the last several titles on PC and Mac – and that perhaps explains why they ‘get it’ so thoroughly. Like the iPad version before it, everything from the PC version is replicated here – but system power and control constraints mean that, yes, everything does move a little more slowly. The iPad lineage does mean that Civ 6 on Switch is best experienced in handheld mode, and it’s here where I think it’s most potentially exciting. Civ is exactly the sort of game where you can whittle away the hours fiddling and micro-managing, thus making it perfect for flights, trains and other long journeys. Handheld mode is best as it replicates the tablet experience and in turn the mouse-based nature of the original game, awarding the ability to tap the screen to get through various menu options a little quicker than if you’re using Joy-Con controllers. This is all seamless enough and works well, and despite the diminutive screen size text and interface elements are always nicely legible. Still, if you dock the game or prefer the tactile experience of a controller in your hand, the Joy-Con control scheme is pleasingly simple. It’s naturally slower than the touch screen but dodges that easy pitfall of forcing the player to dig through endless sub-menus to reach what you want. The important stuff is always right at your fingertips – your advisers, managing research, scrolling to the next active unit that’s yet to receive orders this turn. The controller works well, but the touch screen or more importantly a unique combination of both the touch screen and regular controls are by far the most natural and intuitive way to play this version. The fact you can seamlessly swap between the control methods is a clever decision that makes things much more comfortable, too. You can be using the Joy-Cons to browse about, but then if you want to click a specific unit or city you can quickly do so with a jab of your finger. It just works and feels right. Performance is decent, too. The game chugs a little between turns in the later stages when Civs have larger, more complex empires, and scrolling around is where you’ll notice the performance dip most keenly. Interestingly the game seems to be more smooth when in handheld mode, perhaps because on the tiny screen it can drop the resolution a little and free up system resources for other things. The initial load times are long (PC players, here’s a good measurement: Sean Bean definitely gets time to finish his monologue), but once in-game it runs nicely. This isn’t a game where a solid, sky-high frame rate is a pressing issue anyway, mind, and the important thing is it moves along at a decent pace. It does, though as previously noted it will be a slightly slower experience than PC players might be used to, especially on late-game turns when there’s hundreds of units milling about. Civ 6 is a decent port, but the reason it’s grabbed me so thoroughly on Switch even after hundreds of hours logged on PC is because this game is perfect for this sort of handheld mode play. 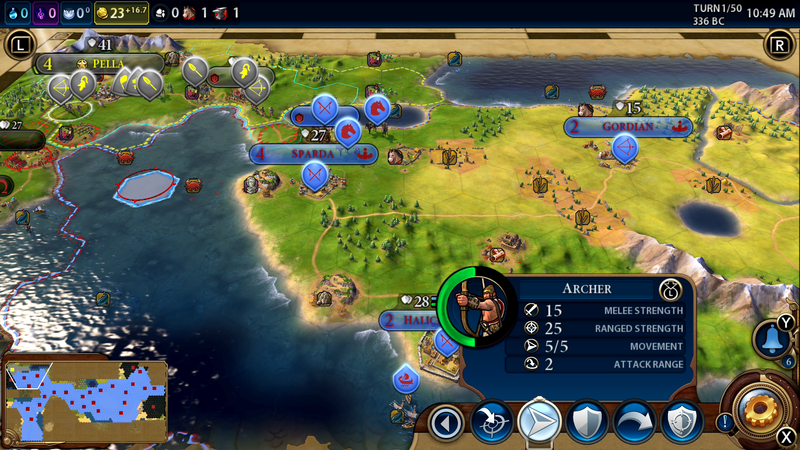 Civ’s turn-based nature makes it perfect for quick pick-up, put-down sessions, and the Switch’s nature as a dedicated gaming device means that this is now arguably a better shout for a few turns of Civ on the go than a larger, more cumbersome laptop. The Switch continues to be a place where games I already love find a new lease of life, especially on the go. XCOM next, please?